A cloud of dust quickly replaced the smokestacks after dynamite sent them crumbling downward. 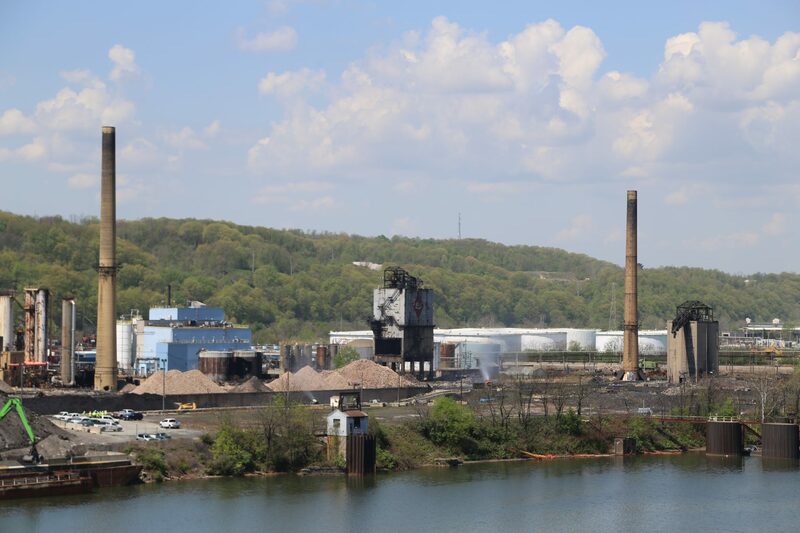 The Shenango’s Coke Works “smokestacks” before they were imploded Tuesday. The view has shifted the past few years during Ken Holmes’ daily walks along the Ohio River, and on Tuesday, it changed yet again. A series of planned dynamite blasts sent the stacks, plus a coal bunker, crumbling to the ground. 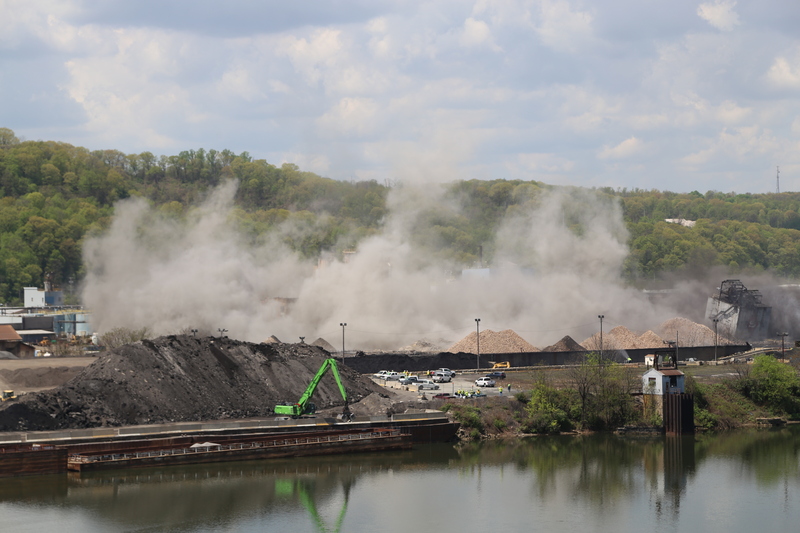 “It was just such a good day when the plant closed, and it was even better to see the plant itself disappear,” Holmes said while he watched the dust settle atop a nearby hillside. Holmes is one of the founders of Allegheny County Clean Air Now, which pushed for years to shut the plant down. He lives in Bellevue, which he said was just downwind of the plant. “I wanted to be closer to the city, and the price I paid was breathing polluted air from a plant that had been there since the early ‘60s,” he said. Group members were concerned that the facility’s pollution harmed public health. Residents sometimes had to stay indoors due to a foul smell, and they had to clean soot off their porches and windowsills, said Angelo Taranto, another founder. Over the decades, the plant paid $2 million in fines for air and water violations. Owner DTE Energy said in 2015 that it would soon close its doors due to a downturn in the steel industry, as the demand for metallurgical coal tanked. The plant heated the coal at a high temperature to form coke, which is used to make steel. Demolition of the site began three months ago, said Brian Corbett, a spokesperson for DTE. He said he expects cleanup work to continue for two more years. The company has not decided what to do with the property, he said. Members of the Clean Air Now group are pushing DTE to make sure the next use for the site does not emit any pollutants. Holmes said the group would like solar panels to go in, or possibly a water taxi service or a hi-tech manufacturing facility.